"60,000 Hitting Lessons" is a baseball hitting instruction book for parents, coaches and hitters. 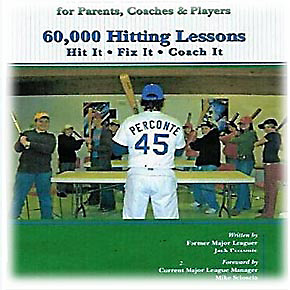 Former major league player Jack Perconte has written this book to assist anyone looking to help young players with their baseball hitting training. Parents of baseball players and baseball coaches who want a hands-on approach to helping their sons and daughters to improve their hitting skills and at the same time keep it an enjoyable experience for all. Hitters who are looking for the edge to put them ahead of the competition. By learning how to perform the correct hitting fundamentals, how to get out of hitting slumps and learning a great mental approach this book can make all the difference. A step by step approach offering practical hitting instruction and a baseball training guide that can develop a hitter of any age. With the foreword by former major league player and current Los Angeles Angels manager Mike Scioscia this book offers a detailed look at coaching baseball hitting. After retiring from professional baseball, former major league player Jack Perconte has given approximately 60,000 baseball lessons with players of all ages. He has provided baseball hitting training for thousands of players including many who have gone on to professional baseball. His greatest teaching thrill has always been helping the average or below average baseball player to be able to compete and feel good about themselves. This baseball hitting instruction book includes much more than just the fundamentals of hitting. It covers the teaching methods and hitting drills that he used to improve the baseball hitting skills of many aspiring students. This quality baseball hitting training guide will show parents and coaches ways of teaching and dealing with young players that will help form a close bond that will last a lifetime. Many parents and coaches of young baseball players were good hitters in their day, but that does not automatically make them good baseball instructors. Along the same line there are many coaches who can tell the batter what they are doing wrong but cannot tell them the ways to fix the problems. This instructional baseball hitting book will break down the fundamentals and inform the parents and coaches how to help the players adjust as they move up in age and levels. Furthermore, by relating some of his major league experiences Jack Perconte helps parents, coaches and hitters to understand not only the importance of good hitting instruction but also what it takes to be a great coach and mentor to ball players of all ages. The quality hitting instruction and coaching tips provided can make all the difference in a baseball players career and enjoyment of the game. Jack Perconte's "60,000 Hitting Lessons" should be a "go to" guide for great baseball hitting instruction and a baseball training guide to raise a great hitter who will "love the game".